In June 2007, the coastal cliffs at Oamaru lost a lot of ground, including a conservation area for blue penguins and the factory seen here. Photo: Murray Hicks. Last year, the Ministry for the Environment released guidelines on adaptation for local government. Prof Ellis said while they were a step in the right direction, they were just guidelines. Her report recommended that government ensured cross-regional equality, so communities did not feel unduly punished by proactive councils. An example of this was if communities chose to build sea walls for protection, there was a risk that beaches ended up getting lost to the engineered protection works. The report laid out the need to pre-fund adaptation measures on a national level because it would overcome inter-generational inequality in the future. “It’s going to be very difficult for them to have any kind of wellbeing comparable to ours if we don’t pre-fund adaptation,” Prof Ellis said. 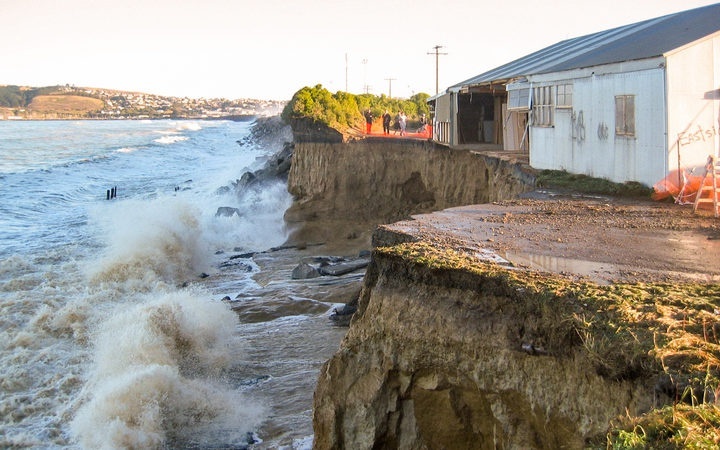 It would also overcome inequality among exposed regions, because the ability to respond to sea-level rise depended on rate-payer capacity, which varied across New Zealand. Prof Ellis said it was vital young people were engaged early as they had the greatest stake in the future. She said often community consultation meetings were held during the day, tended to amplify the voices of people who were old and disproportionately wealthy, and young, disadvantaged people needed representation.